Winnie the Pooh:Day for Eeyore was written by and Disney Productions. Winnie the Pooh:Day for Eeyore was published by Disney Press. 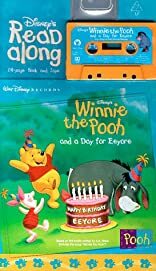 Subjects of Winnie the Pooh:Day for Eeyore include Action & Adventure - General, Audio - Children's Classics, Children's Audio - 9-12, Classics, Toys Dolls & Puppets, and Toys, Dolls, & Puppets.